Since 1985, Hughson Nut Incorporated in Hughson, California, has specialized in the processing and marketing of inshell, shelled and blanched almonds to high end confectionary users, such as chocolate producers and bakeries, both domestically and internationally. The company was using traditional bucket elevator conveyors when Andy Fontana, Maintenance Manager and Butch Coburn, Plant Manager, began their search for a conveying system that would meet the ever changing food requirements while reducing their maintenance, cleaning and sanitizing downtime. Coburn and Fontana discovered DynaClean sanitary conveyor systems from Dynamic Conveyor Corporation in Muskegon, Michigan. After experiencing success with one horizontal DynaClean conveyor, the company purchased six (6) vertical Z conveyors to replace their bucket elevators used in multiple areas of their processing plant. One of the nut processing conveyors was specially designed by Dynamic Conveyor for dual lane sortation using one conveyor belt. 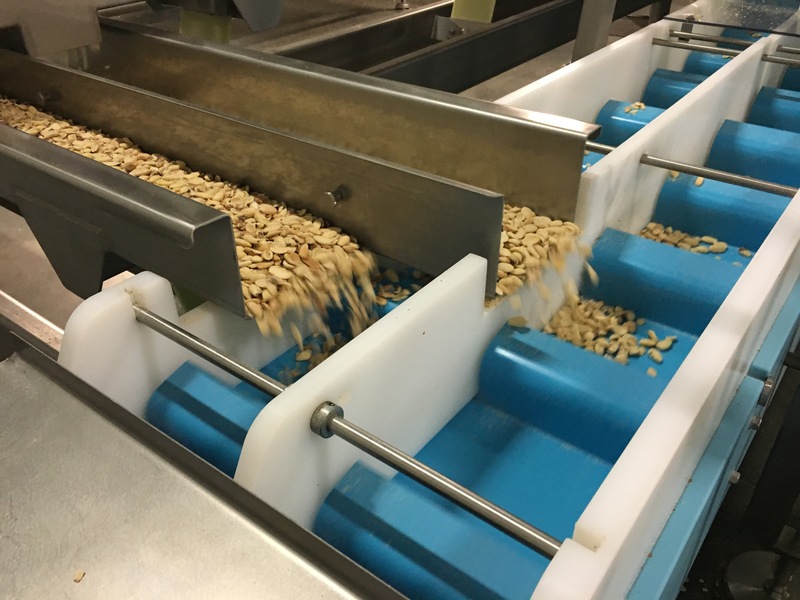 With the ever changing food requirements and food safety challenges, the company has found that they are able to clean the DynaClean conveyors much faster than their plastic bucket conveyors – from daily wipe down to full tear down of the conveyors. “Now we are confident that everything is clean and our product is safe. We know that there is no longer the possibility of hard plastic from the buckets getting into our product,” states Coburn. “With minimal, to no tools required, every part is accessible and quick to clean and sanitize”, Fontana references the design of the DynaClean conveyor. Hughson Nut’s sanitation team has different processes for cleaning the conveyors daily, weekly and monthly; including belt removal, which does not have to be done as often as it did on the bucket elevators. “The DynaClean conveyors are much quicker and easier to clean than the bucket elevators. The time is cut in about half, which means our labor has been cut in half,” explains Fontana. “Our new process is basically the same as our old process, but we have doubled our production per hour. With the installation of state of the art electronic sorting to accompany the dual lane conveyor system, we are now using 5 employees compared to 6 per shift and we have doubled our production,” says Coburn.